Jack Bell Gallery is pleased to present a new body of work by Beninese photographer, Leonce Raphael Agbodjelou. His ongoing portraiture project, 'Citizens of Porto-Novo,' captures the people of Benin's capital. Using a daylight studio and a medium format camera, Agbodjelou interprets the experience of a generation caught between tradition and progress. This new series looks at Porto-Novo's competitive bodybuilders who compete locally and nationally; the subjects aspire to one day achieve recognition beyond West Africa and work towards a better life in Europe. 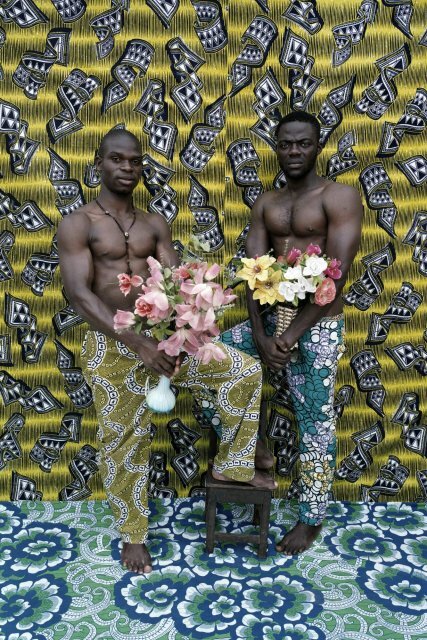 The bodybuilders have been a popular subject in African studio photography since the 1950s and 60s, yet for this series Agbodjelou has them holding fake flowers, a somewhat incongruous touch. 'Plastic flowers have always been used in the traditional studios to show style and taste', he says. 'I thought they added a nice contrast to the musclemen'. Agbodjelou is one of the preeminent photographers of the Republic of Benin. Born in Benin in 1965, he learned the craft from his father, world-renowned photographer Joseph Moise Agbodjelou (1912-2000). Joseph Moise opened a photography studio in Porto-Novo in 1960 and today Leonce Raphael continues the family business on that same site. He is the founder and director of the first photographic school in Benin and recently been appointed president of the Photographer's Association of Porto-Novo. Leonce's work has been exhibited at the Saatchi Gallery, London, and the Kelvingrove Art Gallery and Museum, Glasgow. Recent acquisitions have been made by the Pitt Rivers Museum, Oxford, and the Museum of Modern Art, Equatorial Guinea.